I am happy to announce my new Windows Phone 8 app “Cloud OS MVP Roadshow for Windows Phone 8 app” which is now available for download from Windows Phone store. The Cloud OS Roadshow is a full day event hosted by Microsoft MVPs and Community members which lets the participants learn about Windows Azure and its features. 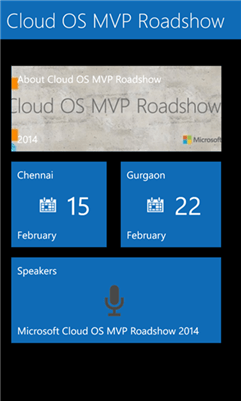 Cloud OS MVP Roadshow is an app for the Microsoft Cloud OS Roadshow events happening in India in February. The app displays the venue details, agenda, speakers and the registration links for the event . Download the Cloud OS MVP Roadshow for Windows Phone 8 from Windows Phone store.